The Rockers defeated The Orient Express to kick off the show in a thrilling 20-minute battle. Big Boss Man beat The Barbarian. As they were feuding, Randy Savage and Queen Sherri cost The Ultimate Warrior the WWF Championship; the Iraqi Sympathizer Sgt. Slaughter took advantage of the opportunity. The Mountie picked up a win over Koko B. Ware. Ted DiBiase and Virgil teamed up against Dusty and Dustin Rhodes, and is memorable due to the face turn by Virgil, who attacked DiBiase with the Million Dollar belt following their win (due to weeks of enduring DiBiase’s abuse). Your commentators are Gorilla Monsoon and Roddy Piper. The previous Rumble was Ventura’s last, which is a shame as I’m going to miss him. Andre The Giant was scheduled, but was pulled due to health reasons. Some people say this is one of the best Rumbles of all time. I’m not so sure, but let’s get started with Bret Hart & Dino Bravo entering as #1 and #2. The main thing I wanted to look at was .. does it still feel like I’m watching the WWF of the 80’s? And the answer is very much so, with a few exceptions. Bret Hart was visibly bigger, he’d bulked up to look more like a heavyweight, and the fans got behind him. I liked the way he’d occasionally signal what he was thinking to the crowd, and it went a long way in getting him over. The match didn’t seem too exciting to me out of the gate. Greg Valentine came out, and eliminated Dino Bravo. Always liked Valentine’s work, but he’s looking heavier than usual .. and not in a good way. Paul Roma out next. And a nice surprise! It’s the Ultimate .. wait a minute, who’s that guy running very fast to the ring with tassles on his boots? It’s The Texas Tornado AKA Kerry Von Erich! Starting to get in to the match a bit now. And up next .. Rick Martel. More on this guy later. Oh my god it’s Saba Simba .. actually it’s Tony Atlas in a typical stereotype African gimmick; didn’t last long as Martel got rid. Bushwacker Butch is back again, and the crowd still loves him. JAKE ROBERTS for the fourth year in a row! Hercules out next, and then Tito Santana for his fourth year in the Rumble! Roma eliminated himself by missing Roberts with a cross body. My god it’s The Undertaker! Only a couple of months in to his long WWE career; and the crowd hated him. Straight for Bret Hart .. and The Hitman is gone! He kept fighting, no-selling every blow from Roberts and Tornado. Here comes The Superfly! Taker eliminated The Bushwacker. My patriotism kicked in at the sight of Davey Boy Smith! So far I’ve got 90’s feels from Bulldog, Taker, and Bret. Smash in next. You know what I forgot to mention? If you look at ringside, you’ll see Bill Alfonso before he became RVD & Sabu’s manager in ECW, along with a young Shane McMahon, working as the referee’s for this match. Rick Martel eliminated Roberts! Did not see that coming, and it only extends Jake’s terrible luck. Hawk out next! Marking the debut of The Road Warriors in the Rumble. He got outnumbered though. And here’s a surprise, Shane Douglas long before his famous ECW run. Hawk eliminated Snuka. #18 .. come on, where are you? For the first time in Royal Rumble history, a wrestler no-showed his spot. This was Randy Savage, as he’d been chased out of the arena earlier in the evening by Ultimate Warrior. Here comes Animal! So we got both Road Warriors in there now. He came to Hawk’s aid, who was getting beat up on by The Undertaker. They double-teamed The Deadman, and eliminated him! And the crowd popped. Shane McMahon got in Taker’s face and told him he was gone; and to think .. they ended up in Hell in a Cell at Wrestlemania decades later. By the way, Valentine and Martel are still in the match. Crush out next, but I much prefer Ax (who isn’t in the match). The amount of times we’ve almost seen Martel get eliminated .. is astounding. HOOOOOOOOOO! Here comes the first Rumble winner Jim Duggan. Martel & Hercules teamed up to take out Hawk. Going by just “Earthquake” this time, he entered the ring and looked set on winning. One hellacious exchange between him and Animal, til he charged at Earthquake too quick and got thrown over. The Intercontinental Champion Mr. Perfect out next. and doing the smart thing by taking his sweet time. Duggan came swinging at Perfect, but the IC Champ was smart enough to use his momentum against him for an elimination. Hogan time! There goes Smash. Hogan and Earthquake had an intense exchange. Noticed Bulldog come to Hogan’s aid more than once. Haku in. Hogan got rid of Valentine! There’s a new longevity record set by him; but Martel is STILL in there. Neidhart in. Santana out via Earthquake. Bushwacker Luke entered the ring, walked right into Earthquake, and got eliminated. He lasted four seconds, but the Warlord’s elimination a couple of years ago remains the record. Next up we got something NASTY! It’s one-half of The Nasty Boyz Brian Knobbs (before he got super fat and useless). Got in the ring with all guns blazing .. which was a bad idea as it got the attention of half the competitors. Might have noticed this if you watched the video, but Earthquake really likes chilling out in the corner. Give that man some popcorn .. he’s not expending any extra energy. Literally leaning up against the rope to catch his breath and everything. Never seen anyone so relaxed in a Rumble. Knobbs elimimated Hercules (who lasted a long 37 minutes). The Warlord and Tugboat came out as #29 and #30. Hogan eliminates Crush. There goes Warlord .. much like what happened a couple of years back. Shane Douglas out, thanks to Knobbs. So you got two massive, strong guys like Bulldog and Tugboat working together to take out Martel .. who’s beaten Valentine’s record at this point .. and they can’t eliminate him!? What the hell! Hogan got rid of Tugboat, after almost being eliminated himself. Bulldog dropkicked Perfect out. Martel eliminates Neidhart! This guy is invincible! And now he’s after Hogan! He’s got some major balls. Haku out via Bulldog. So at this point, Bulldog turned his attention to Martel, and Knobbs/Earthquake teamed up on Hogan. Martel goes up to the top rope, but Bulldog notices and shakes the rope. Martel gets straddled, then Bulldog brutally clotheslines him to the outside. I feel sad .. what could have been for Rick Martel. Let’s pay tribute. Noticing Hogan getting beat down, Bulldog came to his aid again. Unluckily for him, Earthquake and Knobbs left Hogan and eliminated him. And from here it was predictable, Hogan got Knobbs out, then subsequently eliminated Earthquake. For the second year in a row, Hogan stood tall as the winner of the Rumble. He showed his patriotism by holding up fan signs, and waving the American flag. He was set to face Sgt. Slaughter at Wrestlemania for the title. Hogan became the first man to win two Rumbles, and the first to win back-to-back. Randy Savage is the first man to no-show. The longevity record changed twice, first when Valentine outlasted DiBiase’s record, and again when Martel was eliminated with a time of 52 minutes, 17 seconds. Jake Roberts & Tito Santana were the only names to be entered in to the first four Royal Rumbles. Still feels like I’m watching an 80’s product, but it was still really enjoyable. Loved seeing The Undertaker, Bulldog, and The Road Warriors. Rick Martel was damn impressive .. I kept waiting to see those purple trunks disappear, but they wouldn’t go away. Sad that Macho Man couldn’t be in it, although it makes sense from a storyline perspective. Aside from Earthquake and Hogan, I couldn’t believe anyone else winning. It lacked Warrior and Savage for sure. There’s not much more I can say about it. 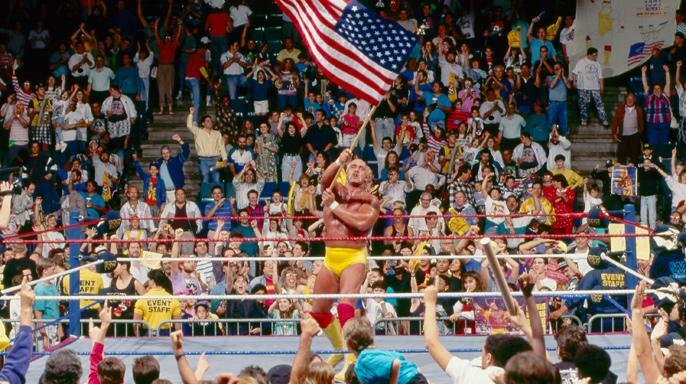 Hogan had to win due to The Gulf War, and Americans needed their superhero to lead the charge. Bulldog, Bret Hart and Undertaker all looked great. Everyone else seemed like they had no chance, and that’s what I take from the 1991 Rumble. It was good. It was entertaining. Was it the greatest ever? Eh, I think that’s a stretch. I enjoyed the first three just a little more, because it had special moments and/or unpredictable winners. There was a small chance Bulldog could have won, but soon as he was gone it’d have been clear to anyone.